1. In order to receive an accurate quote, ensure your measurements are precisely made. Indicate all backsplashes, cut-outs, finished edges, radius edges and overhangs on your project plan. 2. 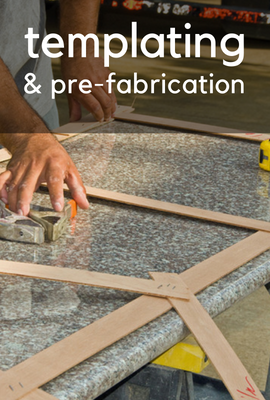 Granite Top, Inc. does not normally remove existing countertops at the time of template. However, this is a good time to ensure that you cabinets are level and plumb, as granite cannot be installed on poorly installed cabinetry. If there are any problems, ensure that you have them rectified by a professional prior to the installation appointment. 3. All appliances (stoves / trash compactors / sinks / cook tops /counter vent extractors / dishwashers / refrigerators etc) must be available on the job-site at the time of template. Drop-in sinks and cook-tops will remain on-site; however, under-mounted sinks must be given to the templater for fabrication. 4. All cabinetry must be installed at the time of template, level flush and plumb. Granite Top, Inc. requires 1/8″ tolerance to be covered by backsplashes whether it is tile or slab. 5. On countertop depths of 25 ½” or less, sinks must not be wider than 18″. Faucets should not be located directly behind oversize or “D-shape” sinks, but rather be offset for structural integrity. 6. You must provide an on-site representative who has authority to review and approve the template design on your behalf. Changes to the template design cannot be made once the templater has left the job-site.